A mixture of local wildflowers pop up near Arvin. Kerri Esten took this photo near Arvin of a mixture of local wildflowers: Owl's Clover (the pinkish-purple ones) and Pygmy-leafed Lupine (the blue ones). Owl's Clover (Castilleja exerta) are related to the large group of plants known as Indian Paintbrush -- all are in the Castilleja genus, and you can see the resemblance, though most Indian Paintbrush species are some shade of red. Owl's Clover derives its common name in an interesting way, having nothing to do with live owls. Instead, it appears that there are some tiny owls roosting in the feather duster-like flower heads of Owl's Clover. You have to examine them very closely, and if you do you'll see a little white patch here and there — that's the owl's face, each with two little magenta dots for eyes. Right below the face there is even a rounded, slightly protruding area that looks like an owl's chest. They resemble miniature versions of the wise old owl from Winnie the Pooh. Like the other Castillejas, Owl's Clover are hemiparasitic, meaning they derive some of their nutrients from adjacent host plants. This is why you won't find Owl's Clover or Indian Paintbrush growing in complete isolation — they need to be among other plants to survive. This is also why they don't need much in the way of leaves, since they are not having to make all of their own food. Owl's Clover gives the appearance of being a purple flower, but upon careful examination you can see that they are actually a dark magenta or burgundy with hot pink tipped sepals, and the combination looks simply purple from a distance. NATURAL SIGHTINGS is a regular feature of the Tehachapi News edited by Jon Hammond which showcases photos of the natural beauty that enhances the quality of life in Tehachapi. 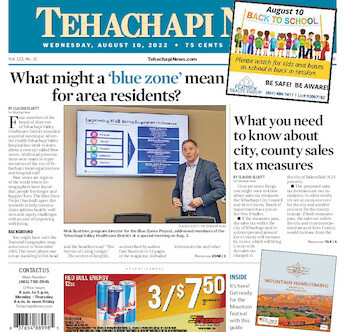 If you have a good quality image of plants, animals, insects, trees, birds, weather phenomena, etc., taken in the Tehachapi area, you may submit it to the Tehachapi News for possible publication. Submissions can be dropped by the News office in the form of a print or CD, or sent by email to: editorial@tehachapinews.com.